Back at the beginning of August, I bought two big sweet potatoes on a whim. They looked so nice, and I was trying to change up our veggie routine (I've been on a roasted broccoli or roasted cauliflower kick for, oh I don't know, forever...) with something not green or white. Brussels sprouts, asparagus, broccoli, cauliflower; they are all staples in our house, and are good for you! But we needed something different. 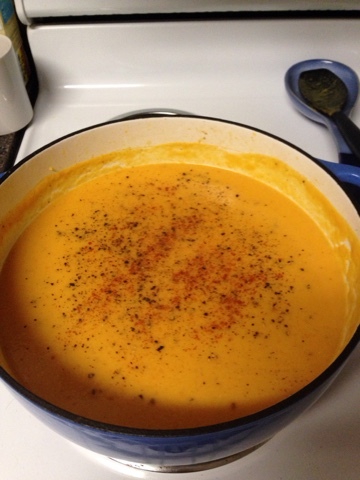 That said, when I arrived home, Trav kindly reminded me that he's really not all that into baked sweet potatoes, so we settled on soup instead. I had grabbed an acorn squash and some apples in the same shopping trip, so I came up with this soup recipe on a random week day when I was wishing for some Autumn weather to come by. 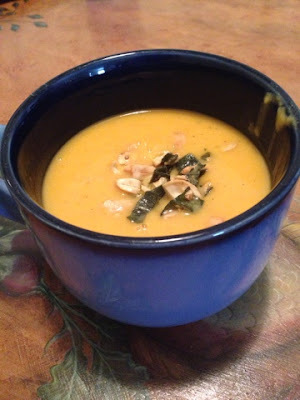 This would be a gorgeous Autumn soup (though it is delicious anytime!). It is a lovely mix of sweet and savory, chock full of flavors that remind me of crunchy leaves underfoot, and make me feel as cozy as a warm sweater on a cool day. Thankfully I froze some for us for when the weather cools. The best part, tweak it with the flavors you love, and maybe trade the impossible to peel acorn squash for a butternut squash! Toppings are easy to change out too. 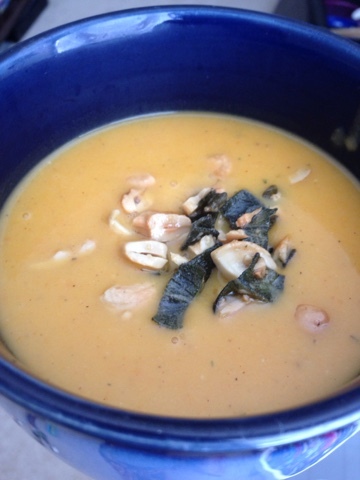 Inspiration from this soup and this soup. Optional: Sage leaves and cashews, crumbled, for topping. 1. Heat bacon grease and coconut oil in a dutch oven over medium-low heat. Add onion to pot and cook until translucent. Add garlic and cook for a minute more. 2. 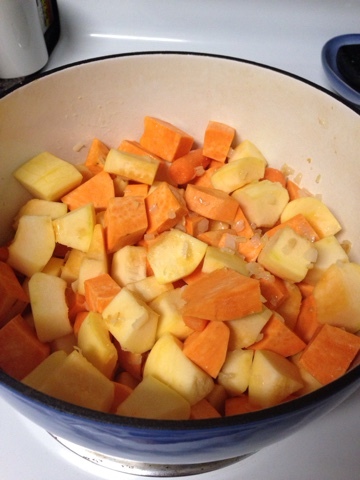 Add in the squash, sweet potato, carrot, apple, vegetable broth, curry, red pepper, cinnamon, ginger, parsley, and nutmeg. Stir and bring to a simmer. 3. Cover and cook for 25 - 30 minutes (until veggies are tender). 4. While your soup cooks, make your topping. Gently melt a pad of butter in a pan at low heat. 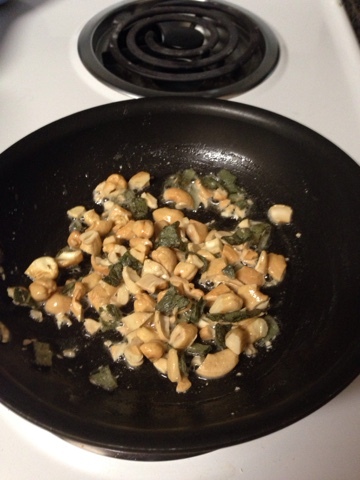 Add crumbled sage leaves and cashews. Stir gently until lightly browned. Set aside. 5. Turn off heat. 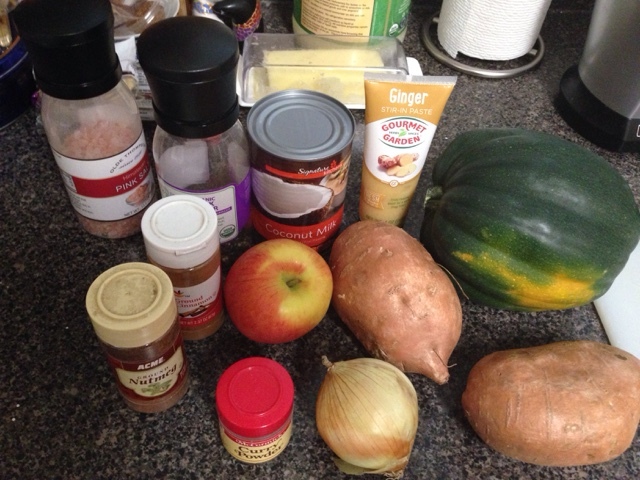 Using an immersion blender, begin to pureé soup, adding in the coconut milk, salt, and pepper. Once smooth, taste and adjust seasoning, as needed. 6. 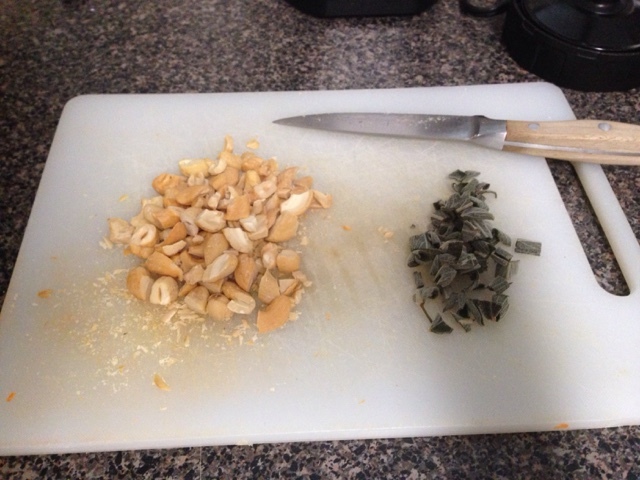 Ladle into bowls and top with sage cashew topping. Enjoy! !